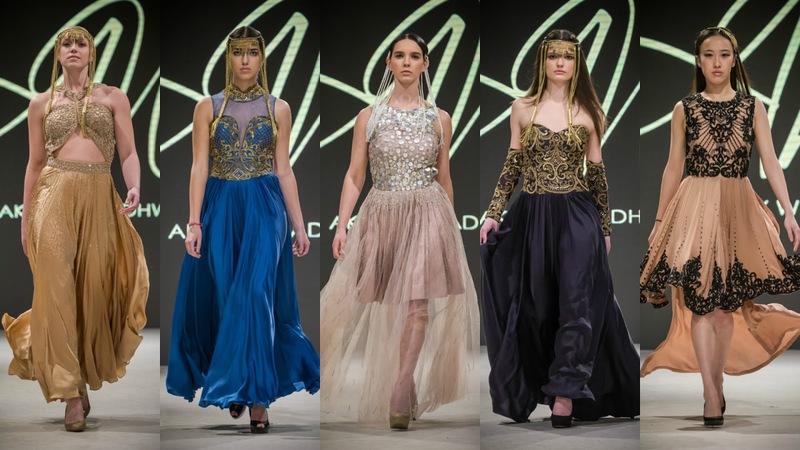 Friday at Vancouver Fashion Week (VFW) was packed from first to final show. Kudos go out to the staff that was in charge of seating as several times people had to be moved to make room for guests of specific designers. One of the joys of VFW is that we don't have to leave the venue after each show and stand in line-up after line-up. We instead get to spend our time on the runway snapping photos and connecting with many - including designers showing this week. It's actually easier for fashion weeks to kick you out and re-seat each show, so I always appreciate that VFW accepts this challenge and allows me to stay inside. I hate lining up. My look today was a blouse, soft jacket and skirt in deep turquoise by JAC by JC. My wonderful necklace was purchased in the Project H Shop in Holt Renfrew Vancouver. It was made by a NYC designer who showcased many seasons ago at VFW shortly after she graduated from design school - Laura Siegel. My earrings were also from a local designer, but I no longer remember who. 1. This is VFW's 27th season! 2. The designers showcasing this season represent 25 countries! 3. This is my 18th season covering VFW! Some of the wonderful people I'm hanging out with each day! Today I'd like to touch on hair and make-up. One day each season I bring treats to the volunteers who get little attention such as the hair and make-up teams. They have such a huge impact on the runway shows, but we never meet them. Each has their own room with probably 15 artists in each working feverishly to finish models, especially hard when there are quick changes. 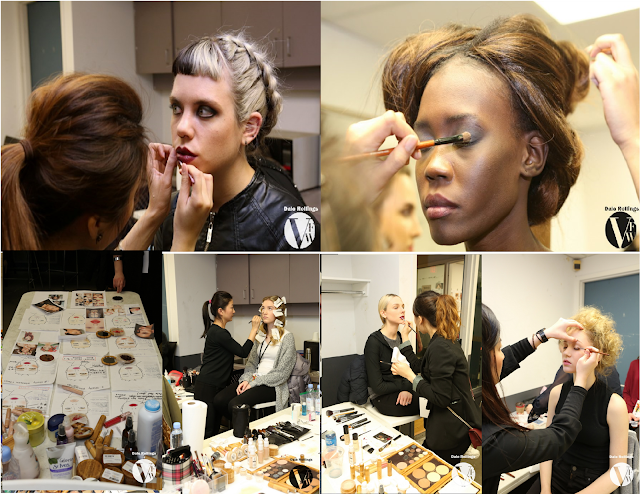 The hair and make-up have been outstanding - really complimenting the designer's collections. Fortunately photographer Dale Rollings has been back stage capturing some of their work. Revlon Professional - an iconic brand with an extensive range of high-performance products with clients in over 100 different countries - is the VFW exclusive hair sponsor this season. 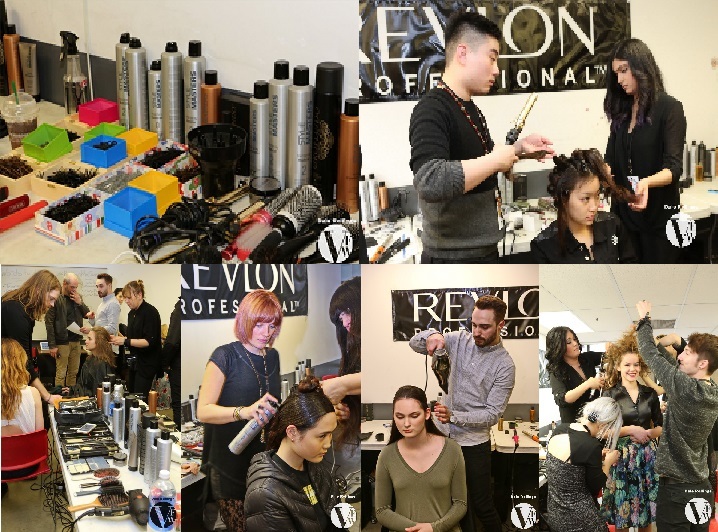 "Each unique hair look is the final statement of the designer's vision and Revlon Professional is pleased to provide the products and expertise to help do that this season," says Jessica Stevenson, Marketing Director Revlon Professional Brands Canada. 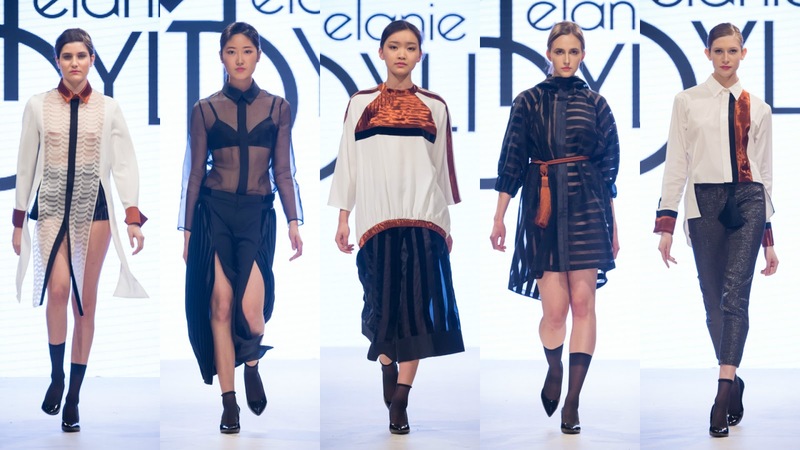 Elate Cosmetics is the official Make-up sponsor for Vancouver Fashion Week F/W 16. I love this brand description from their Facebook page - "Clean, vegan, of the earth. We love the beauty of ritual. We use, and make cosmetics for the ritual of beauty." Their extensive line of natural make-up products is available at several locations in Vancouver, on Vancouver Island, in Regina, Saskatchewan, and on-line for those in other locations. And now for the designer's I decided to feature today. Honestly, this was the toughest day yet and no one in the audience around me had the same favourites. I hope you get a chance to see images of all the collections shown this day. Sousa Pitti took me by surprise. Andrea stepped totally away from the expected and offered an amazing collection of garments with a strong Japanese influence. From the designer, "The whole collection was inspired by a book that is considered to be the world's first novel. It is called The Tale of Genji and it was written around 1008 - 1021 by a Japanese lady in waiting called Lady Murasaki Shikibu. The description of the clothing is beyond words and what interested me the most about the story is that it is supposed to be about a prince in the Heian Period. The further it goes, the more you realize the story is really about the many women that took a part in his life. It is a description of the way women lived back then when society was a 100% male based." This was a strong collection from first to final look and the tailoring was exquisite - something I always appreciate. Anchored by black, this collection showcased a wonderful selection of just the right prints used in just the right places. I loved the great accent belts and the variety of separates offered. And looks were not just interesting - they were very wearable. Would love a few pieces in my closet! French designer Melanie Dylis is a graduate of the Atelier Chardon Savard in Paris. Her early work as a pattern designer is evident in the beautiful cut of her garments. The designer admits that fashion is her therapy, it lets her express her artistic side. From the designer, "Between architectural rigor and free complexes femininity with a rock accent, clothes offered characterizes a contemporary women. Design and conception are the heart of creations. Her collection dress a versatile woman. The cuts are feminine and sometimes more masculine. Details figures as symbols which give the rythm to transparency movements that subtly reveal the women body. The metamorphosis operates and the woman becomes singular." What drew me to this collection was a lovely balance between silhouettes that hinted of the classic, but with a slightly different expression - perhaps an open back, the choice to use a sheer fabric, unexpected slits up the centre front of pants or an intriguing use of colour blocking. The palette of white, copper and black was striking, the mix of fabrics from sheer to textured added interest and the tailoring was strong. There were several pieces that I wouldn't mind having in my closet. I will be keeping my eye on this designer and hope she returns to VFW. Toronto menswear designer Joao Paulo Guedes was launched onto the international stage when he became the first winner of the Toronto Men’s Fashion Week Emerging Menswear Designer Award in 2014. This award set him firmly on his current path. His work has been featured in publications around the world, such as: Vogue Italia, GQ Brazil, Elle Canada Man, and many more. Of Brazilian descent, he has traveled widely and finds inspiration from the art, media and images everywhere he goes. The label offers unique, fashion forward looks and exclusive custom prints. From the very first look on the runway, I knew we were in for something special. It's always a treat to have menswear presented, especially when it challenges the status quo. While there were many strong looks to embrace, there were also some modern cuts, new silhouettes and unusual prints. On the West Coast in particular, I know men can find it challenging to step out of their comfort zone, but hopefully shows like this will provide the incentive. 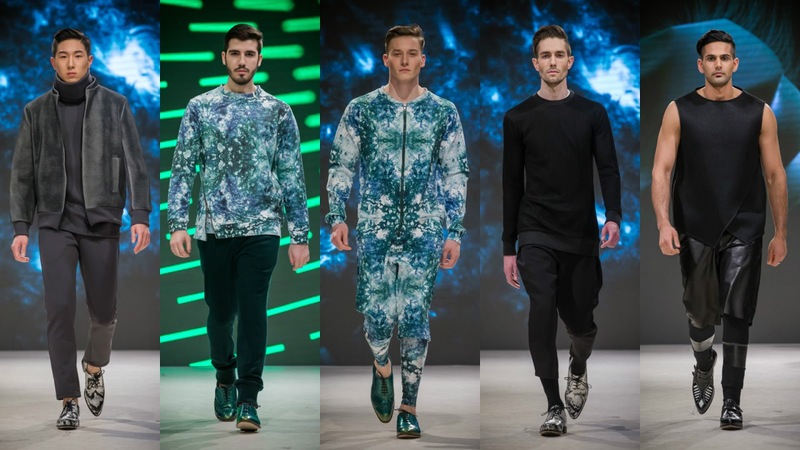 Time for men to have more fun with their fashion and embrace a wider expression. Well done! Akshay Wadhwa carries haute couture and prêt-à-porter exclusive lines, and caters to clients throughout India and across the globe in the US, UK, Canada, Australia, South Africa, Thailand, Hong Kong, Singapore, London and Dubai. This Delhi-based designer comes by his talent genetically. His family has been involved in the textile trade for three generations. He studied at the Istituto Di Europeo Di Design in Milan, worked with several major fashion brands and even helped develop a collection for Milan Fashion Week. In 2009, he established his own brand which blends the rich heritage of South Asia with contemporary high fashion. The collection this evening was called Primal Power and was inspired by Female Indian Medieval Warriors. The fusion of elements - east and west - were a perfect blend and the designer's tailoring skills were obvious. I also want to touch on something mentioned in the collection's introduction. For Wadhwa, it is about more than fashion. His business also offers a way to make a difference. From the designer's bio, "Akshay Wadhwa is committed to the cause of developing his country and its most valuable asset: its people. Akshay Wadhwa holds classes for his artisans’ children, providing them with free basic education on Sundays. As an equal opportunity employer, Akshay Wadhwa champions the development of female artisans in a largely male-dominated industry. He strongly encourages the up-skilling of his female artisans by providing them with opportunities for growth and a flexible working environment including work from home." Kudos on both a fabulous collection and on using your business to make a difference.